Being a fussy eater meant that I deprived myself of many delicious meals that were cooked in my mother’s kitchen. As per my father’s diktat certain foods put on the table had to be eaten and finished by everyone without any fuss. But being the chip off old block, I would stubbornly refuse to eat certain dishes. Palak paneer never touched my lips. I guess my father gave me that leeway coz I would polish off my mother’s Palak Alu Bhaji (Spinach & Potato Stir Fry) with much fervour. But the pureed spinach curry did not fit into my idea of palatable food. I had this repulsion for foods that looked, in their consistency, like baby food and had no texture in them. And I carried that idea till after marriage. 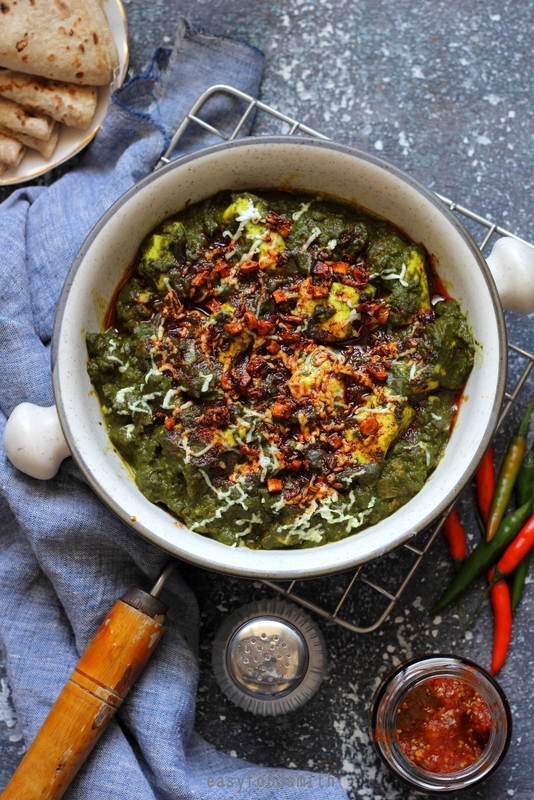 When my Nani (maternal grandmother) invited my husband and me to visit her after my marriage, she cooked a delicious spread for us and Palak Paneer, being the delicacy of sorts for Punjabis, was sitting on the table among some favorites of mine. She lovingly served us the food and I didn’t have the heart to tell her how much I hated eating palak paneer. However, not to be rude, I took a little of that curry in plate. One morsel of that curry with roti and I was floored by how delicious it was! 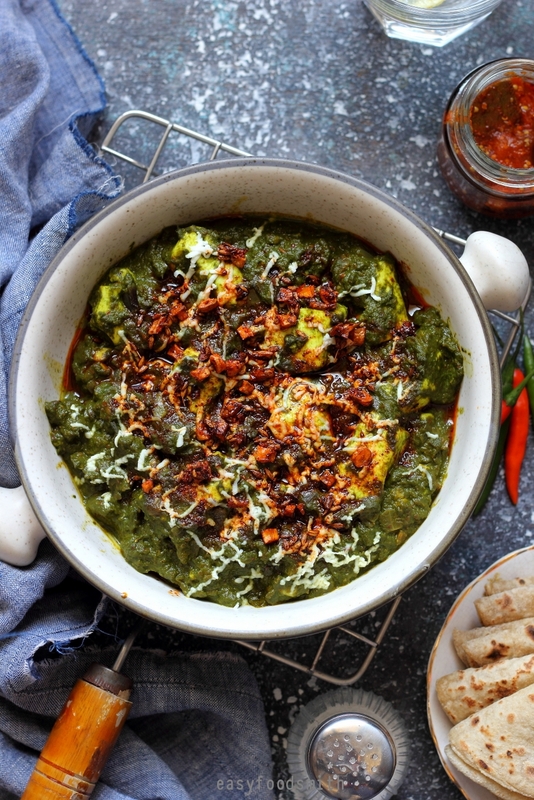 After coming out of the food coma, induced by her food, I took the recipe from her and since that day, palak paneer is featured regularly on our winter food menu. And as are the uncanny ways of history repeating itself, when I made and offered this dish to my then four-year-old, she made a revolting face seeing the curry. I had to cajole her into eating it citing her favorite character Popeye eating the spinach and growing so strong. At least that made her try it and to my utter joy she loved it. 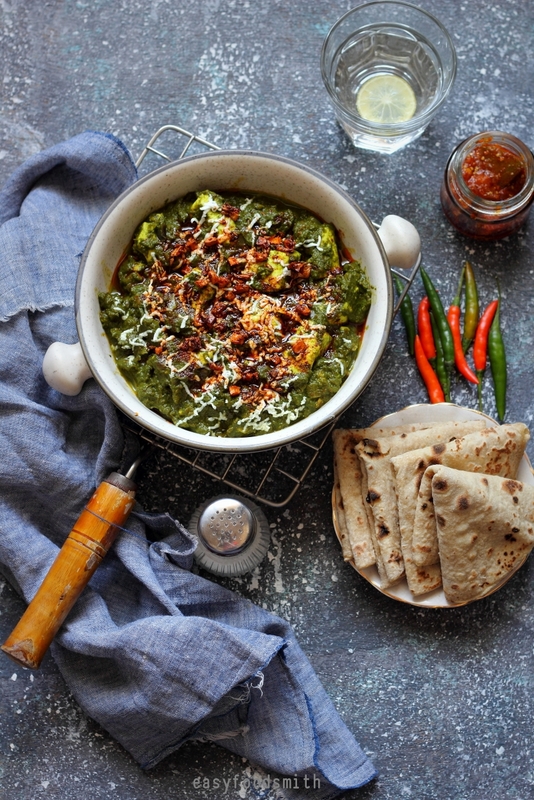 Now, a teen, palak paneer is one of her most loved dishes to have. 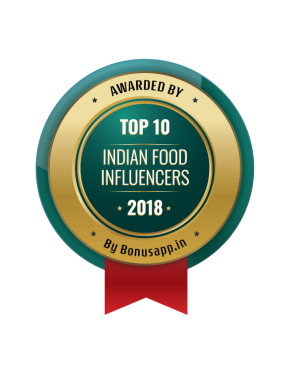 And, with that, I am posting another simple recipe for Indian everyday curry series where I am compiling list of dishes that my daughter requested me to upload. In a pot, heat water and once it comes to a boil, add the spinach and cook for a minute. Remove the spinach from the water and plunge in cold water to stop the process of cooking. Drain water and squeeze out excess water from the spinach. In a blender, add 50 ml of milk and add spinach. Blend till the spinach is nicely pureed. Remove from the blender and set aside the puree in a bowl. 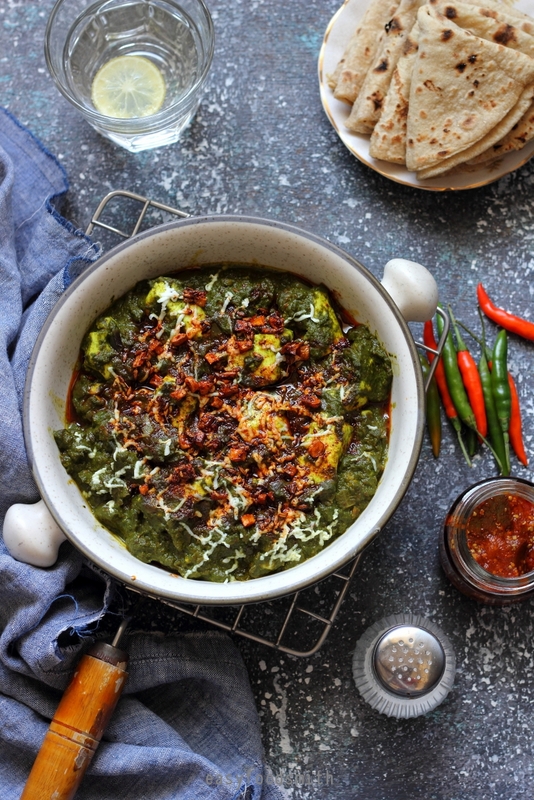 Wash and cut the paneer in cubes or in any shape that you desire (some like it roughly crumbled). Set aside. Peel, wash and finely chop the onion. Peel and chop the garlic. Heat oil in a pan or kadahi (wok) and add half a teaspoon of cumin seeds along with the asafoetida. Once the seeds begin to crackle, immediately add the onion, garlic and ginger. Fry till the onions begin to just turn golden. Add the salt along with the spices. Fry for a few seconds and then add the tomato. Bring the heat to medium and cook till the oil separates and is visible around the edges of the masala. Add the paneer pieces and cook for approximately half a minute. Add the spinach and stir it gently to blend it well with the masala. If you find the consistency too thick, add the remaining milk (or water if you prefer water over milk) and stir again. Remove from heat and transfer in a serving bowl. At this point, you can garnish the curry with finely grated paneer before proceeding to the second tempering. In a small pan heat the ghee and, on low heat, add the remaining half teaspoon of cumin seeds and the garlic. Cook till the garlic becomes aromatic or till it begins to turn golden brown. Remove from heat and add the degi mirch. You will be able to cook the degi mirch in the residual heat. Pour this tempering over the paneer and serve hot with chapati or any flat bread of your choice along with pickle and salad. Enjoy! 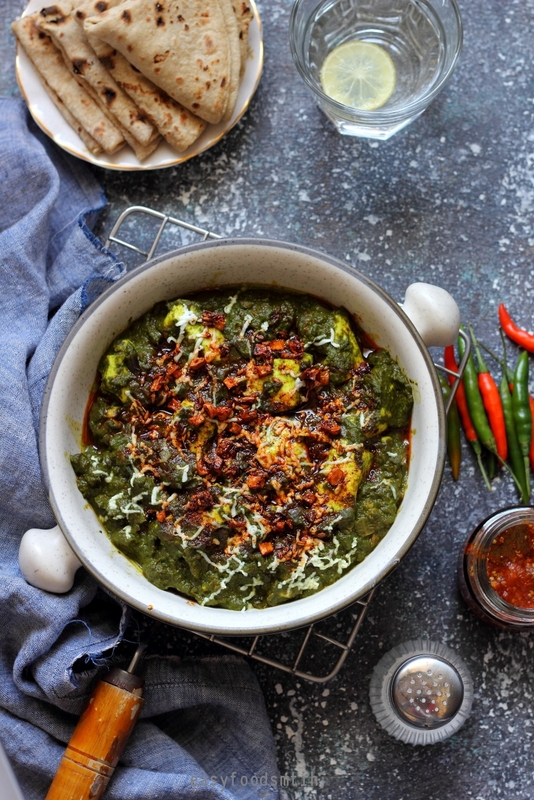 Note – The amount of ratio of paneer and spinach can be altered to suit your preference. Note – Also feel free to make the curry as thick or thin as your prefer, by thinning it down with water or milk. Note – I do not use cream for this recipe and instead go in for milk. Feel free to use cream to make a richer curry. 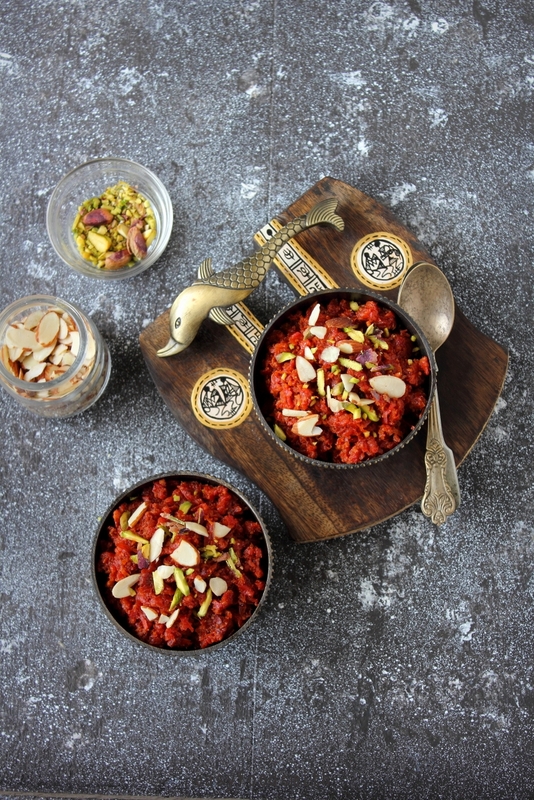 Note – Some cooks add pan roasted and crushed kasoori methi towards the end of the cooking. And others add fresh coriander and green chilies when they blitz the spinach to puree. Suit yourself if you like it that way. I always love curry! It must be so good to dip some homemade bread into that curry gravy. What a classic recipe! I have always liked this one but I know what you mean…certain textures in food do turn me away. But then there is more for everyone else! I’ve loved this dish from the first time I had it — SO good. Yours looks delish — thanks. I love winters and the leafy greens. This is a classic recipe for North Indians.